Happy National Nashville Hot Chicken Day! I truly love food holidays. I've been working on this for quite some time and I'm really excited that it finally came together just in time to celebrate the food holiday in such a big way. Ok so this recipe is obviously far from accurate. I mean there's no chicken for one, I'm vegan remember? The breading is made from coconut flour but don't get it twisted this dish not gluten free. I just don't keep regular white, whole wheat, or rice flour in my house otherwise I'd be trying to make cookies and cakes all the damn time. And 1) I'm not a good baker; 2) I don't even like sweets; and 3) food waste is my biggest pet peeve (see answers 1 and 2 for context on why this applicable). Another way this dish is far from accurate is that Nashville Hot Chicken is typically breaded and then coated in a mixture of lard, cayenne pepper, and if you ain't into spicy foods you should pray there's a sprinkling of brown sugar too; then it's deep fried. I tried to recreate the whole lard thing by using olive oil to dredge my seitan cutlets but I kinda gave up on it being "perfect." I just gave my air-fried cutlets a light bath in Frank's Red Hot and it turned out great. 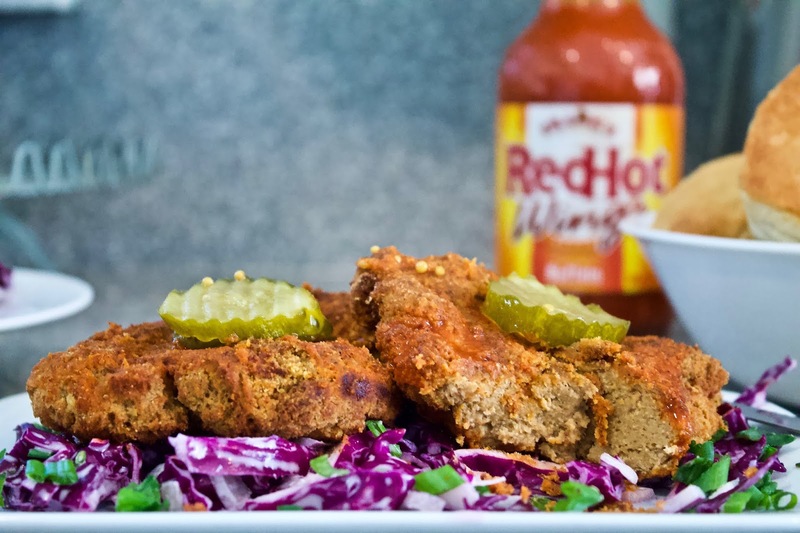 Nashville Hot Chicken is traditionally served with pickles and white bread. We were close - we devoured ours with bread and butter pickle chips, a simple slaw, and biscuits. Don't let the ingredient list and steps deter you, it's hella easy. I actually made the seitan the night before so if you plan ahead you could do it too. Then mix all the wet ingredients together but separate from the dry. Thanks for being patient; now you can mix them both together! Knead for a minute or so and the tear your seitan into 4 equal balls and shape them into patties. Pull out your IP and put your seitan cutlets in there. Pour the 1 cup of veg broth in the IP too. On manual setting let that baby go for 4 whole minutes. When the timer goes off don't mess with it. Don't touch it. Nothing! For an hour ok?! You're just going to ruin your seitan if you're going to be impatient. Mix all those dry ingredients together in a big bowl. Pour the oil in a shallow dish. 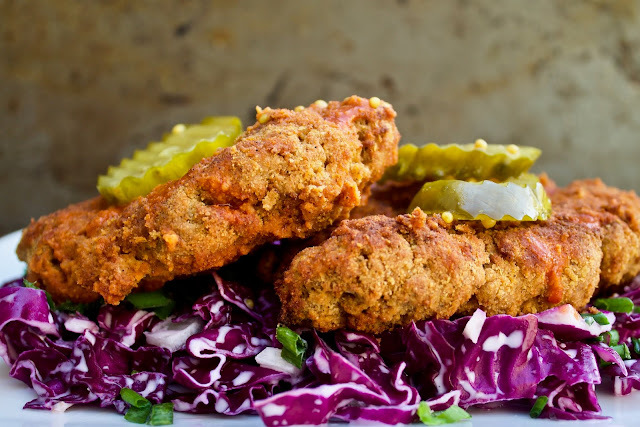 Dredge your seitan cutlets in the oil and then coat with your breading mixture. After you've got them good and coated, throw them in your Air Fryer for 15 minutes on 360. Toss in Frank's and serve with a pickle. ICYMI, the instant pot seitan recipe above is my go to. You can find several other posts on this here blog o' mine that feature it.